Need a refreshing tomato summer salad? 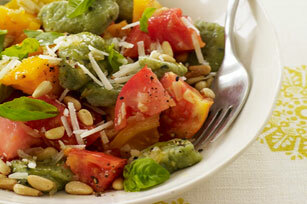 Try our recipe for Tomato, Avocado and Basil Salad. Avocados and basil leaves play all-important supporting roles. Whisk dressing, lime juice and garlic until blended. Combine all remaining ingredients except pine nuts in large bowl. Add dressing mixture; mix lightly. This is a great side salad to serve at your next barbecue.